This model is based on the "Torchwood Office" in Cardiff, Wales which is seen in the Torchwood and Dr Who BBC series. 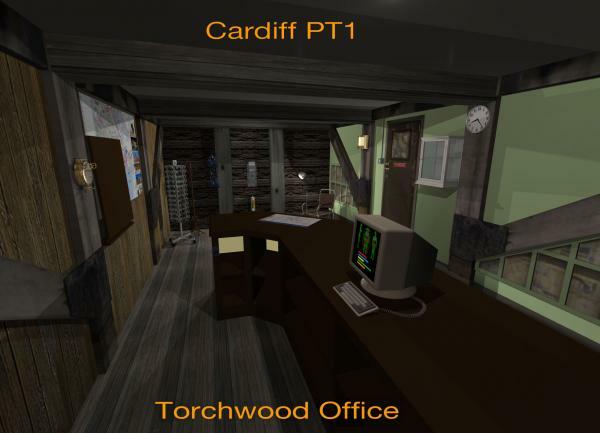 CardiffPt1 can be used as a standalone figure as the torchwood office, aka vistor's entrance, aka Ianto's office for interior scenes. If you need the surrounding area, you will need to download the CardiffPt2 zip file. Please read the "!ReadMeCardiffPt1.txt" file for more information. Tom Long (10 months ago) Inappropriate? Dood! Incredible.. I can't imagine the amount of time and effort that went into all of this Who and Torchwood stuff.. Really...Out-damn-standing. And thanks! awesome thank you -my wife and me just started to "binge-view"rtorchwood and dr.who on amazon prime and its most inspiring thanks for the great stuff. How do you make the walls invisible? I think that's what CurtBrown was asking. Orville (5 years ago) Inappropriate? Merry Christmas indeed thank you so much. Big Dr. Who fan, just now getting into Tourchwood, and this is lovely. Thank you!